I recommend that each of my clients eat 1-2 servings of fish a week. That consists of about 4 to 6 ounces of fish per serving. Of course one of the first responses I get is, “ Can’t fish be dangerous, what about the mercury content?” This is an important question and one that you need to be aware of when making your seafood choices. Fish is a quality source of protein that’s relatively low in fat and cholesterol. It’s also a great source of nicacin, vitamin B12, vitamin D and of course Omega-3 fatty acids – which many of you know about by now. Multiple studies have shown that individuals who consume fish have better control of their weight. When fish is added to a diet designed to promote weight loss, more total fat and more abdominal fat is lost. Beyond the benefits for fighting arthritis, colities, heart disease, stroke and certain cancers, new research has shown that Omega 3 fats have a strong link between mood and depression. Individuals who had diets high in Omega 3 fats have much lower rates of depression. The pollution we have added to our oceans has contaminated the environment where fish live and eat. There are many toxins, but the main one that is focused on is Mercury and more specifically methylmercury. Methylmercury builds up in some fish more than others, depending on what they eat. Methylmercury is a neurotoxin that causes harm to our nervous system. 2.) Mix up the types of fish and shellfish you eat since mercury levels vary. You can safely eat up to 12 ounces of ‘approved’ fish. Another concern is with the PCB levels found in farm raised fish, particularly salmon. Pollutants primarily come from the fish meal that is fed to these industrially raised fish. Some studies have shown extremely high levels of PCBs in farm raised Salmon. When available, the best choice is to go with Pacific Northwest wild caught salmon. 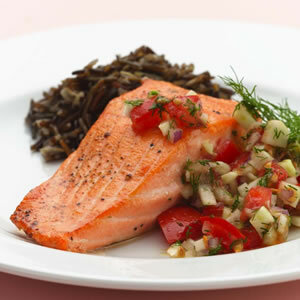 This lean and powerful fish is high in protein, vitamins D and E and Omega 3s. In my opinion, there are too many benefits with the right types of fish to avoid seafood all together. I think a good starting goal for healthy nutrition is by making fish a dinner choice one night per week. Good choices are wild caught salmon, halibut, cod, sole and polluck. Shellfish is an excellent choice as well, particularly crab, lobster, shrimp, scallop and oysters. The key things is to get educated. Study the chart below and find the good choices you like from the chart below. Ideally make sure your choice is below 0.25 for mean mercury content. The closer to 0.1 obviously the better.